Faculties: law, economics and business administration, international business administration, cultural sciences studies (with inter-disciplinary orientation, including comparative social sciences, history of culture, studies of literature, linguistics), International Business Administration, interdisciplinary research institutes for transformation studies, ethics, literature and politics. Profile: University oriented towards Europe, taking on a bridging function between Eastern and Western Europe; special role in the German-Polish relations; 18 per cent of all students come from Poland; the curricula of all faculties are interlinked; cultural studies are of an inter-disciplinary nature; intensive language training. 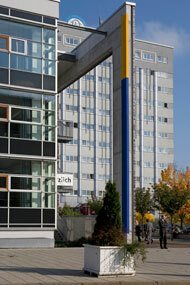 The European University Viadrina in Frankfurt (Oder) is located in the centre of Europe at the Polish-German border; its international nature is its trademark. Students and lecturers come from around 80 countries. International exchanges with more than 250 partner universities and language courses of the highest standard are an integral part of studies. The three faculties, Law, Economy, and Cultural Studies, cover 26 first-degree and second-degree fields of study. Many of them enable students to gain international diplomas. When studying for a “Master of European Studies”, for example, students can receive both a German and a Polish, French or Turkish diploma. The conditions are perfect: great lecturers, small seminar groups, direct contact with the research staff, individual counselling within the field of study, overseas internships and international professional career planning. German is the main language of instruction but some classes are in English or Polish as well. Since it re-opened in 1991 Viadrina, with its location at the Polish-German border, has become a recognised address in the international arena: 6,000 students are currently studying here, with a quarter coming from abroad. European and interdisciplinary aspects of law, economy and culture play a crucial role in the programmes of fields of study in all faculties: Law, Economics and Cultural Studies. Viadrina is an ideal university for all those who wish to study at an overseas university characterised by an international nature. Adam Mickiewicz University in Poznań is the largest university in north-eastern Poland, relating to the tradition of the Bishop Jan Lubrański Academy of 1518, and later the Jesuit College which received an academic institution privilege from king Sigismund III Vasa (Polish: Zygmunt III Waza). The priorities of AMU include strengthening and developing the didactic potential and increasing the number of students completing degrees in fields of study which are crucial for the knowledge-based economy. The annual programme of study of all types is constantly being expanded since new proposals are being added and the university continuously occupies top places in numerous academic rankings. The Adam Mickiewicz University in Poznań consists of 15 faculties, the Institute of European Culture in Gniezno, distant didactic centres in Piła and Słubice and in the city of Poznań itself, for instance, the modern Morasko Campus with an area greater than 100ha. AMU also means a diversity of more than 280 fields of study and specialisations for the candidates for both full-time and extramural studies and more than 100 postgraduate programmes are offered. Classes are taught by an experienced research staff (about 3000 academic teachers) who have at their disposal good facilities, a unique research apparatus and a possibility for improving their professional skills in numerous international exchange programmes. Students at AMU enjoy a variety of scholarships, numerous opportunities to study abroad, domestic and international grants and a contact network in the universities of Europe, Asia and both Americas. The European University Viadrina in Frankfurt (Oder) plays a crucial role in it since a cross-border research institute, the Collegium Polonicum in Słubice, is under its and AMU’s patronage. The University Library is an important part of Adam Mickiewicz University in Poznań. Its collection, together with a network of faculty libraries, consists of around 5 million items. Every year, the libraries acquire more than 62,000 new books, ensure access to more than 50,000 electronic magazines, around 18,000 electronic books and nearly 90 international and Polish databases.